Following their listing on the India site, Samsung now appears set to launch the Galaxy On5 and Galaxy On7 in China. The company has listed the smartphones on its Samsung China site, though the Galaxy On5 doesn’t have a complete product page. To recall, the listing of the Galaxy On smartphones in India had provided little details on the Galaxy On7, and the China listing finally fills out the specifications. Pricing or availability details are still not known. Both the Samsung Galaxy On5 and Galaxy On7 smartphones come with a lot of similar specifications with the biggest difference being the screen size. While the Galaxy On5 features a 5-inch display; the Galaxy On7 comes with 5.5-inch display. Both the handsets come with TFT touchscreens and sport HD (720×1280 pixels) resolution. They are powered by a 1.2GHz quad-core Exynos 3475 processor coupled with 1.5GB of RAM. Both pack 8GB of inbuilt storage and can be expanded via microSD card (up to 128GB). 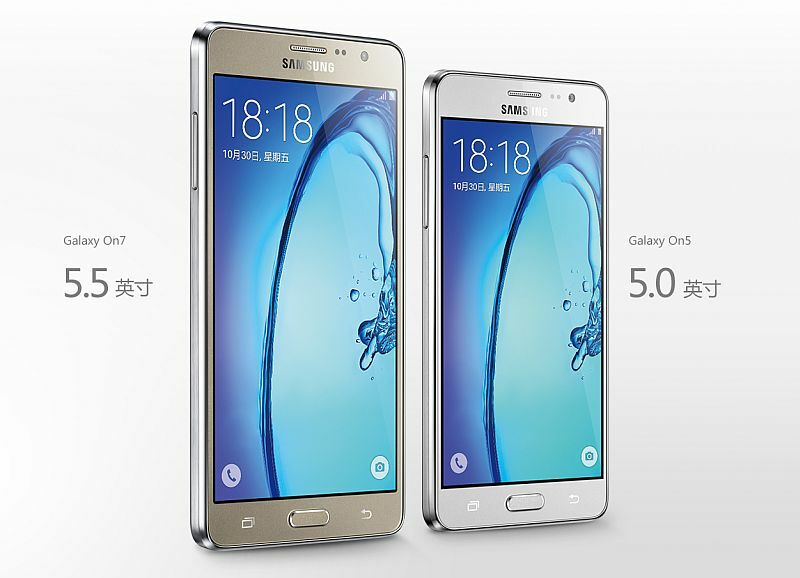 As with the Galaxy On5, the Samsung China listing does not mention the exact Android version of the Galaxy On7. The Galaxy On7 sports a 13-megapixel rear autofocus camera and a 5-megapixel front camera. The rear camera is accompanied by an LED flash and supports full-HD (1080p) video recording. Connectivity options include Bluetooth, GPS, Glonass, Micro-USB, 3G, GPRS/ EDGE, and Wi-Fi 802.11 b/g/n. The dual Micro-SIM Galaxy On7 supports 4G LTE; though no word whether it supports Indian LTE bands similar to Galaxy On5. It is listed in White and Gold colours. The Galaxy On7 packs 3000mAh removable battery, which is larger than the 2600mAh battery seen on the Galaxy On5. It measures 151.8×77.5×8.2mm and weighs 172 grams. The listing shows that the Galaxy On7 also features a metal-styled side frame and sports a leather-feel rear cover.